The first time I saw the catchphrase “The Art of Doing Nothing” associated to Tigran Petrosian was in 1978 (!) when I was reading my first ever Chess book: a collection of Petrosian´s games made by Alberic O’Kelly de Galway. An outstanding work. The game in question was Petrosian-Cardoso, Portoroz 1958. Influenced by this comment or not, in the following years a number of people have mentioned the idea in books and magazines. But, what is “the art of doing nothing” in Chess ,where both players are compelled to make a move in his/her turn?. This is one of the details which makes of Chess a wonderful vital experience. In essence this “art of doing nothing” is related to the famous Taoist idea called “Wu Wei”. (In short because this is not a Taoist Philosophy blog, let’s accept the explanation of “Wu Wei” as “no action or rather “active no-action”) Let’s go back to Chess now and I will try to explain how the concept could be understood. Well,there are positions in Chess where the player cannot engage in active operations. The nature of the position is such that it cannot be improved (it can be worsened though) and the only practical chance is to hold it by making consolidating moves, avoiding committing oneself while, at the same time, one is trying to entice one’s opponent into some sort of activity which will offer us some sort of target. The opponent confronted with an apparently balanced or blocked position may try to do “something” to punish his opponent who is ,apparently, wandering here and there with his pieces. But in fact Petrosian was doing so once he had consolidated his position to the utmost. His pieces were always coordinated and helping each other. When the occasion appeared, they would liberate the inner energy they had accumulated and his rivals’ positions collapsed without any apparent reason. Petrosian was able of spending many moves going to and fro with his pieces,manoeuvring incessantly. Many opponents fell into an illusory feeling of safety…Then, if they are not wiped out by a ferocious unexpected attack, their positions simply collapse as if by magic. (The key words above are “hold“, “consolidating” and “manoeuvring”. Many games have been lost because the player wants to do something when this “something” only leads to creating weaknesses or the appearance of a strong counterattack from the enemy’s side). This is why the expression “doing nothing” is too misleading. 1. d4 Nf6 2. c4 e6 3. 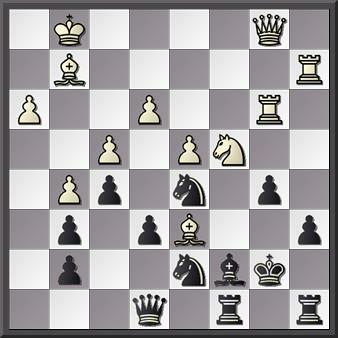 Nc3 Bb4 4. e3 d5 5. a3 Bxc3 6 bc3 c5 7. cd5 ed5 8.Bd3 0-0 9. Ne2 Nc6 10. o-0 Re8 11. f3 cd4 12. cd4 b6 13.Bd2 Bb7 14. Ng3 Rc8 15. Rb1 Rc7 16. Qa4 g6 17. Rfc1 Re6 18. Rc2 Qe8 19. Nf1 Kg7 20. 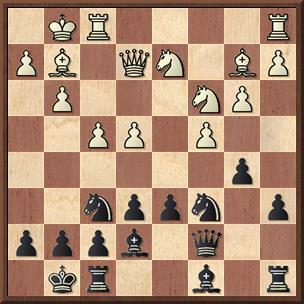 Rbc1 (Once the centre is fixed -Black cannot hit on it: no flank Pawns to do so- Petrosian began his oppressive manoueuvring strategy trying to lure his opponent into “activity”) 20…, Qd8 21. Bb5 Qa8 22. Bd3 Rd7 23. Ng3 Rdd6 24. Kh1 Nd7 25. Qb3 Qd8 26. Ne2 Qh4 27. Qb2 Nf6 28. Rf1 Re8 29. Bb5 Kg8 30. Qc1! Rc8 31. e4!! de4 32. Bg5 Kg8 33. Ng3 ef3 34. Nxh5 fg2 35. Rxg2 Nxh5 36. Qc4 Nd8 37. Qb4 Re6 38. Kg1 Bxg2 39. Kxg2 Re4 40. Kf3 a5 41. Qd2 , Black resigned. 1. d4 Nf6 2. Nf3 e6 3. Bg5 d5 4. c4 c6 5. Qc2 Be7 6. e3 0-0 7. Nc3 h6 8. Bf4 Nbd7 9. cd5 cd5 10. Bd3 a6 11. 0-0 b5 12. a4 b4 13. Na2! Ne8 14. Nc1! (to b3) a5 15. Nb3 Ba6 16. Bxa6 Rxa6 17. Qd3 Ra7 18. Rfc1 Nd6 19. Bxd6! Bxd6 20. Rc6 Nb8 21. Rc2 Nd7 22. Racl Nb6 23. Qb5 Nc4 24. Nfd2 Ncd2 25. Rxd2 Qa8 26. Rdc2 Rd8 27. Rc6 g6 28 g3 Kg7 29. Kf1! 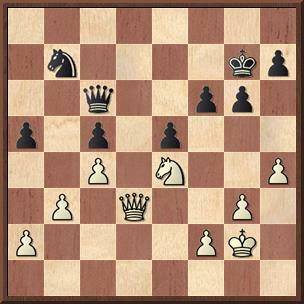 A well-known manoeuvre in Nimzowitsch’s practice) Kg8 30.h4 h5 31. R1c2 Kh7 32. Ke1 Kg8 33. Kd1 Kh7 34. Kc1 Kg8 35. Kb1 Kh7 36. Qe2 Qb7 37. Rc1 Kg7 38. Qb5! Qa8 39. f4 Kh7 40. Qe2 Qb7 41. g4 hg4 42. Qxg4 Qe7 43. h5 Qf6 44. Ka2 Kg7 45. hg6 Qxg6 46. Qh4 Be7 47. Qf2 Kf8 48. Nd2 Rb7 49. Nb3 Ra7 50. Qh2 Bf6 51. Rc8 Rd7 52. Nc5 b3 53. Kxb3 Rd6 54. f5 Rb6 55. Ka2, and Unzicker resigned. Pos. 1. Petrosian played 33. Qd5! The centralization of White’s Queen forces Black to exchange or to retreat with disastrous results. The game continued 33. …, Qxd5 34. cd5 Kf7 35. Nd2 f5?! ( better 35…Nd6) 36. Nc4 Kf6 37. f3 e4? Desperation :37…h5 would have been much better) 38.fe4 fe4 39. g4 h5 40. Kg3 hg4. The game was adjourned here but Black resigned. 16.Nd1 a5 17. Ne3 a4 18.Rab1 ab3 19 ab3 Ra2 20. g4 Nd7 21. g5 Re8 22. Kh1 Nc5 23. h4 Qd8! 24. Rf3 Bf8 25. Rg3 e5 26. f5 Nd4 !! 27. Qf1 Ndxb3 28. Nxb3 Nxb3 29. Qe1 Nc5! 30. Qxb4 Bb7 31. Nd5 Ra4 32. Qd2 Bxd5 33. Qxd5 Rb4! 34. Bf3 Qa8 35. Qd2 Qb7 36. Rg2 Rb8 37 Bd1 , Qxe4 38. Bc2 Qxc4 39. g6 Rxb2 40. gh7 Kh8 41 Rbg1 Qxh4 42. Rh2 Qf4 and White resigned.